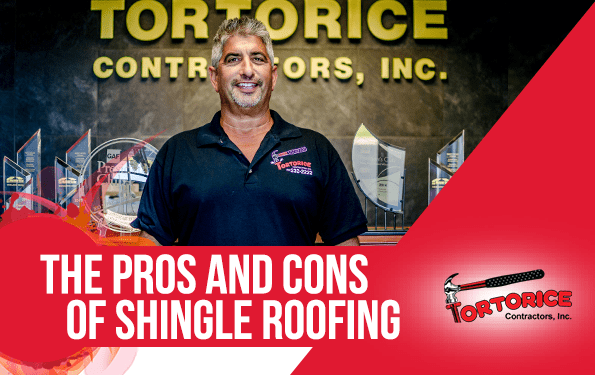 Harrison Township NJ Roofing Contractor: Pros and Cons of Shingle Roofing - Tortorice Contractors Inc. According to a Harrison Township NJ roofing contractor, shingle roofing is one of the most popular material choices for homes in America. Many homeowners and builders like shingle roofing because it is affordable and easy to maintain and install. Aside from this, they are also beautiful to look at. If you’re considering installing shingle roofing on your home, there are some advantages and disadvantages you need to know about. After all, roofing is a big investment and you don’t want to be stuck with the wrong choice. Wood shakes and shingles, as well as asphalt shingles, are perhaps some of the most affordable roofing materials available on the market. For example, according to roofing installers in Franklin Township NJ, asphalt shingles cost $50-$150 per square while wooden shakes and shingles cost $100-$170 per square. This is very affordable compared to other roofing materials like clay tiles, slate, and some types of metal roofing. Many roofing companies in Franklin Township recommend using shingle roofing for houses that have steep slopes. This is because they are easier to install in an inclined space and also because they were designed for slanted roofing. Shingle roofing is easy to cut, fasten, and fit making them one of the easiest roofing materials to install. According to Franklin Township NJ roofers, speed can make a big difference in the cost of installing a roof. Generally speaking, the faster the work is, the lower the cost of labor. This type of material does not need special accessories for roof edges, wall terminators, chimneys, or vents. Choosing shingle roofing might become a big factor when you’re working with a budget. If you want a low maintenance roofing material, shingle roofing is the way to go according to Franklin Township NJ roof installers. To make your shingles last longer, all you need to do is to practice regular maintenance that involves checking for loose shingles, making sure that the roof is debris free to prevent moisture build-up, and to remove leaves or twigs that blow onto your roof. Shingle roofing is also very durable according to Franklin Township NJ roofing companies. They are so durable that workers can step on them without damaging the material. Shingle roofing also has a good lifespan. Asphalt shingles and wood shingles and shakes look good in a variety of home styles. They look good in most architectural designs including ranch, cottage, bungalow, and contemporary. Many Franklin Township NJ roofing companies recommend using shingle roofing because it is lightweight. Their weight does not put a lot of pressure and stress on the home’s support beams so they are easier on the overall frame of the house, unlike clay and tile roofing which are heavy and need additional support. Not all shingle roofing is fireproof. Wooden shakes and shingles sometimes do not have fire ratings. The good news is they can be fireproofed with treatment. However, you need to pay for the additional protection. Roofing contractors in Franklin Township NJ recommend asphalt shingles if you want something fireproof. If you live in a hurricane prone area, you might want to rethink shingle roofing. According to some roofers in Franklin Township NJ, shingles can sometimes tear and blow off in strong winds. This can mean damage not only to your roof but your home’s interior as well. Asphalt shingles and wood shingles and shakes both have poor insulation. While they are easy and affordable to install, your home could need added insulation to prevent heat from escaping or the cold from seeping in if you choose this type of roofing material. They can also get damaged in areas with high heat and low temperatures. Shingle roofing is also prone to mildew according to some roofers from Franklin Township NJ. This usually happens when there is moisture due to a buildup of debris on the roof. Mildew can damage the thin and lightweight shingles, especially if you don’t conduct regular maintenance and inspection of the roof. Asphalt shingles and wood shingles and shakes have remarkably short lifespans. According to a roofer from Franklin Township NJ, slate can last at least 100 years and metal roofs around 50 years, sometimes even longer if they are waterproofed and rust proofed. This means that the 15-30 year lifespan of shingle roofing is very short compared to the two. Shingle roofing is a flexible option for many homeowners. At the end of the day, homeowners want durable and affordable options for their roofs. Discuss your roofing needs with a reputable Franklin Township roofing installer to discuss the best option for your property.